Science teachers familiar with the theories behind evolution understand the need for they, themselves, to evolve as well. As a science teacher, you’re more than aware of the vast amount of research in the education field. You’ve spent time evaluating both your students and your teaching practices, and recognize the importance of constant improvement driven by advanced research in education. Master’s degree programs in science education allow teachers to revisit old teaching theories, explore new strategies in the field, and update themselves on the latest research surrounding the teaching of science. Read on to discover how these programs give teachers the resources needed to ensure student success. How will a graduate degree in science education improve me as a teacher? Over the last several decades, science education has moved further away from simply fact-filled teacher lectures and toward a more inquiry-based method of teaching and learning. Master’s programs provide teachers with research-backed case studies that show them proper ways to integrate inquiry-based instruction in the classroom, giving teachers greater options and expanded opportunities to introduce science concepts to their students in effective ways. With proper education and an understanding of the research behind these teaching methods, inquiry-based instruction gives students the abilities to find solutions to real problems by designing and conducting original investigations. For example, instead of simply requiring students to memorize the law of inertia, students might investigate how helmets help save lives of bikers thrown off their bicycles. These master’s degree programs don’t focus simply on giving teachers expanded teaching tools, however. Teachers also expand their current knowledge of science subject matter and theories chosen from a variety of different specialty areas. Science education master’s program students explore advanced concepts in areas ranging from biology and chemistry, to physics and earth science. Gain a better understanding of how to implement assessment tools in the classroom, determining which teaching methods are successful and which are not. Research and determine the best ways of implementing inquiry-based teaching practices in your classroom. 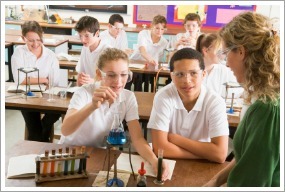 Explore the different ways to present common science topics to your students. Update your knowledge of teaching research tailored to the science classroom. Integrate teaching and learning theories in your everyday practices. Research case studies of different field experiments and learn new ways of presenting concepts in the science laboratory. As policy makers and leaders in the community question controversial scientific topics, teachers must be on the forefront of defending the teaching of these subjects. Learn how to defend, argue, and stand up for scientific inquiry in the greater community. Advanced knowledge of complex science subjects allow teachers to advance their careers and enter positions of leadership at their schools. Many science teachers who earn master’s degrees go on to become teacher leaders, helping to develop future science curriculum at their schools. How will a graduate degree in science education help my students? With a greater understanding of the foundations of teaching the sciences, master’s level teachers often help lead their students more efficiently and effectively. Science teachers with master’s degrees explain complex science concepts in more easily digestible and interesting ways – ways that capture their students’ attention. As more master’s-level teachers implement inquiry-based teaching practices in the classroom, students will become more interested in the scientific process. If you’re interested in learning more about how a master’s degree in science education can lead to not only improved outcomes in yourself as a professional, but for your students as well, research and contact schools offering master’s in education degrees. Pick your state from this map representing Master’s in Education programs throughout the country.